There are often special optical applications that restrict the weight of the optical breadboard being used. In the application the equivalent of an optical table skin can be used to reduce weight. Base Lab Tools now offers our slim solid aluminum breadboards which are only 1/4" thick for these demanding optical breadboard requirements. 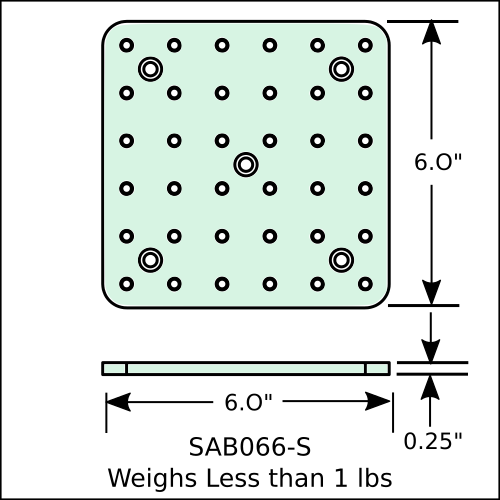 At less than 1 pound in weight this aluminum breadboard is half the weight of Base Lab Tools standard 1/2" standard solid aluminum optical breadboards. The video below highlights Base Lab Tools SAB066-S slim solid aluminum breadboard which can be purchase black anodized or unanodized (for vacuum applications). For Base Lab Tools full line of slim (1/4" thick) solid aluminum optical breadboards <click here>.